Tensions had been brewing between the CCP and KMT throughout the war against Japan. Chiang continued to distrust the Communists and fear that they would eventually usurp his power, while the CCP never stopped spreading the message of peasant socialist revolution that would remove the propertied classes from which many KMT members were drawn. The split came in January 1941. On 31 December 1940 Chiang had given a deadline of 5 days for Communist troops to move north of the Yangxi river – when the transfer was not complete by 4 January, KMT troops launched a devastating attack on the CCP armies, marking the end of the Second United Front. From this point onwards, the CCP and KMT were engaged in two military struggles – against the Japanese, and against one another. The latter would only end on October 1, 1949, when CCP victory and the establishment of the People’s Republic of China were proclaimed. The Communist party had a clear ideology that addressed the needs of peasants with the promise of land reform, stability, national unity, and the vanquishing of the imperialist ambitions that had weakened China for centuries. Support for these ideas was further strengthened by the fact that the CCP practiced what it preached, implementing land reform in CCP-controlled areas in 1947, even as they were still in the midst of civil war. According to US envoy Patrick Hurley, the mass of Chinese “welcome the Red as being the only visible hope of relief from crushing taxation, the abuses of the Army and Dai Li’s Gestapo”. As a result of the attractiveness of CCP ideals, many KMT soldiers defected to the Red Army – in the siege of Changchan alone, 13,000 soldiers and officers (10% of the total), defected within the first month. Consequently, CCP forces grew from 1.2 million in 1945 to 4 million in 1949. Mao pursued a strategy of being prepared to give up land to the KMT and instead focusing on exhausting enemy forces. He had no qualms, for example, about Chiang capturing Yan’an, the CCP’s spiritual homeland, in March 1947, stating the “We will give Chiang Yan’an. He will give us China…It is after all only caves. Empty cities don’t matter. The aim is to destroy the enemy’s army”. The Red Army was well-trained and imbued with a sense of purpose, fighting as they were for the noble cause of a better, united China that would make their lives and the lives of their families easier. The Army also served as an important representative for the CCP cause in the areas it conquered, with soldiers being taught to pay for all damages they inflicted on civilian areas in fighting, ensure that crops aren’t damaged by their actions and treat captives well. Although the CCP portrayed itself as a peasant guerrilla army that won China on the strength of spirit alone, the reality was that following the defeat of the Japanese, they came by a large stockpile of resources. Stalin ordered a weapons and equipment taken by the Japanese by Soviet troops in the north-east to be given to the Red Army. The handover consisted of almost 900,000 rifles, 14,000 machine guns, anti-aircraft weapons, boats and 700 vehicles, including tanks. 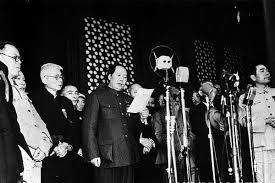 The unwavering control which Mao exerted on the Party meant that his decisions were final, even if other Party members had doubts. This allowed him to carry out a controversial shift from a defensive to offensive strategy in 1947, with the Red Army launching spectacular offensives between April and May that year, crushing KMT forces and causing them to become overstretched. According to historian Lynch “It was the control that [Mao exerted] that allowed him to overcome the doubts of many of his commanders and change from a defensive to an offensive strategy at a critical stage in the civil war”. In July 1944 the US sent the so-called ‘Dixie Mission’ to Yan’an to investigate the CCP as a backable military power and attempt to foster a KMT-CCP coalition. In November 1944 General Hurley, a KMT-sympathetic American was sent to Yan’an to negotiate a United Front. On 10 January 1946 the CCP and KMT agreed to a ceasefire in Northern China and a jointly-run government with the KMT. In March that year, however, the KMT Central Executive Committee limited the scope of the accord, granting the KMT veto power in the National Assembly and instituting perpetual presidential rule. Outraged at this limiting of their power, the CCP re-launched their offensive on the KMT – meanwhile, the ceasefire had given them breathing space to strengthen their hold in Manchuria. In contrast to the CCP, the KMT lacked a clear ideology and strategy for improving the lives of Chinese people. Chiang had refused to undertake land reforms to avoid upsetting the social order under the landlords in the village, and had co-operated with exploitative local warlords to try gain the upper hand on the CCP. As in the war against the Japanese, Chiang was prepared to sacrifice civilian lives in his attempts to destroy the CCP, again ordering the path of the Yellow River to be changed to split enemy forces on either side of the waterway, causing the flooding of 500 villages and displacing 400,000 people. In 1945, at the eleventh hour of is fight with the Communists, Chiang announced a program of economic reform that would introduce tax break for 52 million people, promising a ‘typhoon’ of reform. However, the government lacked the revenue and planning to implement these changes, and they had no discernible effect. This lack of vision and appeal meant that peasants had no incentive to help the KMT or join its ranks, and instead often chose to lend their knowledge of local terrain to the Red Army. Over the course of war with the Japanese, the KMT army had become militarily exhausted, after having fought 23 military campaigns and 1,117 major battles. By 1941, the salaries of Nationalist soldiers were down 78% from what they had been in 1937. The army was also highly regionalised – according to historian Michael Gibson, only 79 of the 165 army divisions actually reported to Nanjing, while the rest were under the command of regional leaders. This meant that Chiang was not able to co-ordinate a unified war effort as effectively as the CCP. Furthermore, officers in his army often used their positions for personal profiteering, selling equipment and supplies on the black market. Training for new recruits was rudimentary, and they were often treated brutally by officers. The incompetence of KMT management of its armies is demonstrated by the fact that between 1938 and 1944 7 million troops were killed by starvation, disease, mismanagement or lost to desertion, while 1 million died in battle. the point that by 1948 guerrilla tactics were no longer required. Instead, open battle and siege tactics used by the CCP to obliterate fleeing KMT soldiers and take cities, with entire divisions surrendering – in one battle 327,000 soldiers were captured and many of these joining the People’s Liberation Army (as the Red Army) came to be known at the time. Facing military defeat, on 21 January 1949 Chiang resigned as Generalissimo and fled to Taiwan – 10 days later, on 31 January 1949, the PLA entered Beijing. By June 1949, CCP forces outnumbered KMT 4 million to 1.5 million, and the PLA controlled all but a few fringe regions of China. On 1 October 1949, the People’s Republic of China was proclaimed.